She lives in disused storeroom with her husband and her children in Reyhanlı, a Turkish town in Hatay near the southern border with Syria. Her first task is to make herself some food for the day. She will spend the next 12 hours in the fields picking fruit and vegetables alongside other Syrian refugees. Next she sees if her eldest son, Feraz, needs the bathroom. The 19 year old is physically disabled and he cannot walk. When the family arrived in Turkey having fled Aleppo, they lived in a cowshed. There wasn’t a proper roof, windows or doors until Caritas provided plastic sheeting, blankets and a stove. Feraz developed skin problems and lost his hearing due to the terrible conditions. Then she checks on Ahmed, another son who is also disabled. He cannot move his legs or his arms. She changes his diaper, once a luxury item for the family but now something they receive as aid. She will get paid 25 Turkish Lira for a day on the farm, about 7 Euros. She returns at 4 pm, when she will wash and feed her children. Caritas provides the family with vouchers, which means sometimes she can even buy something special “like fruit or cheese”. The rest of the evening is laundry or cooking. “At midnight, the batteries are dead,” she said. She can’t sleep though, kept awake by the crying of the children. They’re haunted by the war in Syria, by their flight to Turkey and their grandparents, left behind still in Syria. And sometimes Ahmed might want to itch his head. She is always listening out for that. 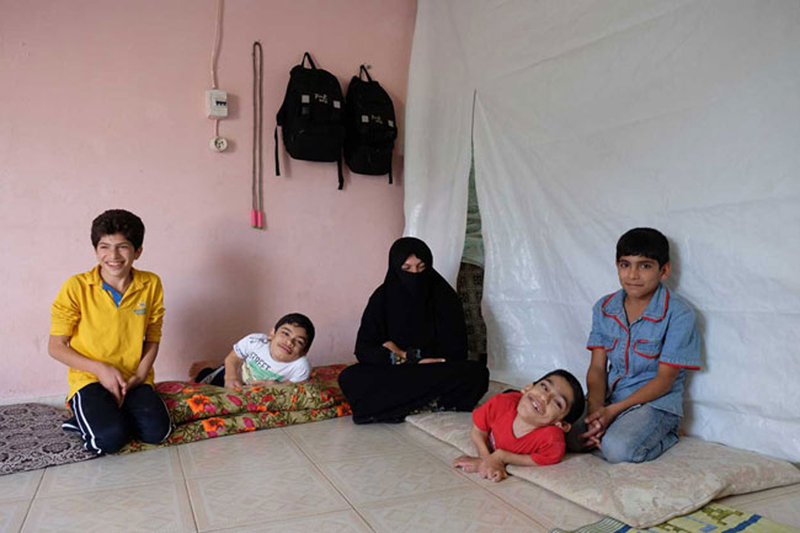 “I go to sleep and dream that when I wake up I will be able to walk,” said Feraz. “I will be able to help my mother.” Then he laughs at the sadness of his words. “We must seem like a hopeless bunch. No country, no health, no money,” he said. They can’t afford self-pity. Her friends tell her she should make her third son, Mustapha, 12, work alongside her. “I can’t,” she said. “He needs to finish his studies.” Mustapha goes to a local school. He loves writing poetry. We are not human like you. We can’t find one on land. The stone cries, kings don’t cry. Just the skies are open to us.